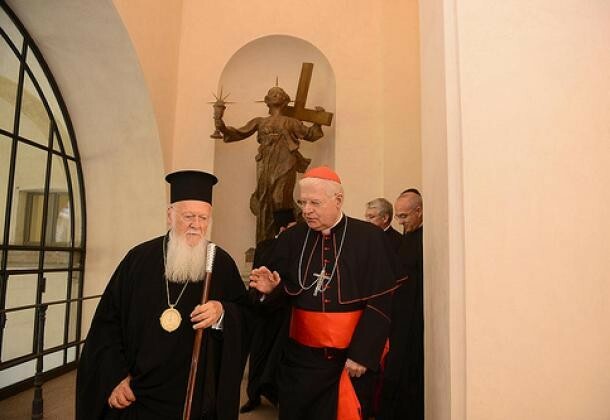 Patriarch Bartholomew Refers To "Leading Contemporary Figures of Orthodoxy"
The Ecumenical Patriarch of Orthodox Christians, Bartholomew, characterized Elder Paisios and Elder Porphyrios, among others, as leading contemporary figures of Orthodoxy in a speech he gave on May 15th in Milan, where he is celebrating 1700 years since the issuance of the Edict of Milan. "We must confess that we are touched by the many years of spiritual effort of Fr. Enzo and your Brotherhood; by your love, interest and respect for the Orthodox Church and Orthodox spirituality, variously expressed through the organization of a monastic life which has the Eastern monastic experience as a prototype; through the organization of conferences to deepen into Orthodox spirituality, where representatives of Orthodox theology and thought participate; as well as through the elevation and study of the life and teachings of leading contemporary figures and elders of Orthodoxy, such as Saint Silouan, Elder Sophronios Sakharov of Essex, Elder Porphyrios, Elder Paisios, and of course through the remarkable publishing work of your Community." The Patriarch noted how many things divide East and West. He even quoted one Orthodox figure who is often used to show the great divide between East and West - St. Kosmas Aitolos. "Oftentimes we have already said, and we will repeat saying it: 'Did you see your brother? You have seen the Lord your God.' And a Saint of the Orthodox Church, Kosmas Aitolos, instead of the classical greeting 'Good morning' or 'Good Evening', greeted his fellow man by saying: 'Christ is Risen, my joy!'" The Patriarch further noted the efforts to translate the works of Saint Gregory Palamas, "a misunderstood Saint" as he referred to him in Italian. On May 17, the respective anniversary celebrations of the Edict of Milan’s commemoration will continue in Istanbul.